Home Conservation What is a Sustainably Managed Forest? 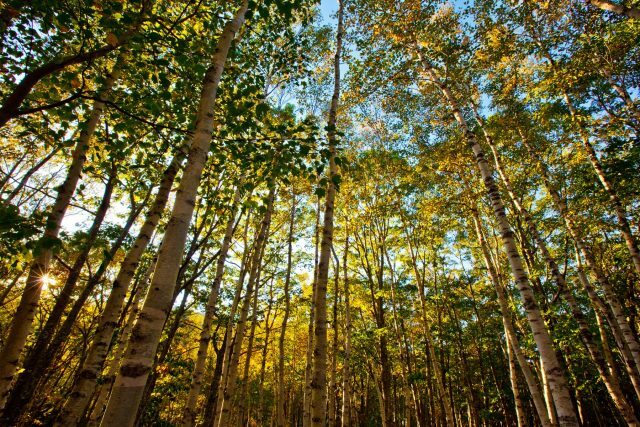 What is a Sustainably Managed Forest? Throughout history wood has always been a vital resource. However as the world’s population grew the pressure from increased demand, plus the need for alternative use of the land covered by forest, led to its destruction at an unsustainable rate. Aside from its use in fuel, in cooking, for paper and as a construction material, forests play a huge part in maintaining the environmental balance of the planet. The need to reverse the reduction of forest became increasingly recognised, and subsequently the ideas and methods behind sustainable forest management took hold again. Though by its nature fluid and constantly changing to meet varying ecological challenges, a sustainably managed forest is one designed to balance the demand for resources against the health and vitality of the forest. This means carefully managing and regulating the forest and woodlands to meet human needs without damaging their overall health and habitat. Within the UK alone forest and woodland coverage had dropped to just 5% by the begiining of the twentieth century, but has now recovered to almost 12%, and in Europe overall has increased 30% since the 1950s. This has taken a concerted effort, acknowledging the importance of our forested areas in the economic, environmental and social welfare of communities. Not for profit organisations such as the Programme for the Endorsement of Forest Certification (PEFC) and the Forest Stewardship Council (FSC) were formed to enable consumers to make more informed choices over the purchase of wood. Certificates obtained from one of these organisations indicates that a managed forest has passed a series of guidelines to show that they are managing their forests in a way that is sustainable and healthy. It is now easier for a consumer to be able to track wood through the production process to see its origin of source. Forests are vital for the health of our planet, absorbing carbon dioxide, a key greenhouse gas. They help prevent water run-off and soil erosion, and facilitate water circulation back in to the air. A manager of a sustainably managed forest acts as a guardian of this habitat, understanding the specific requirements of the particular forest or woodland they are managing. Analysis of the soil and vegetation to maintain an ecological balance is essential, but they also have to assess the commercial demands alongside the environmental and social ones. Timber for construction, paper and for firewood are major revenue sources for a managed forest. Firewood is increasing in popularity, seen as a suitably carbon neutral alternative to fossil fuels for domestic and commercial heating. A sustainably managed forest will use methods that include selective logging to help preserve the vitality of the forest. Although time consuming and more costly, selective logging targets only certain trees in order to maintain the overall balance of the forest. A forest manager will also look to allow trees to properly mature before they are felled, again ensuring the balance of the forest is maintained, while also maximising the economic potential of the trees. Guarding and reacting to potential natural disaster such as fires, plus extending the size of the forest where possible through additional planting are also elements of sustainable forest management. Apart from commercial timber, forests are managed for leisure activities too. Although often privately owned, part of the ethos is as guardian to preserve and hopefully improve the forest to pass on to future generations. Paths are maintained for walkers, runners and cyclists to immerse themselves within and escape in to the country. Educational centres offer children the chance to visit managed woodlands and learn about the wildlife that depends on the forest and woodland habitat, and the importance of preserving this bio-diversity. Holiday homes, camping and horse riding trails all make use of sustainably managed forest area. This amalgamation of the social benefits to the environmental and commercial benefits of the forest is at the central core of the notion of sustainably managed forests. For rural areas otherwise struggling to find economic opportunities, these managed woodlands offer employment and the wider benefits for the local communities which that brings. Within the UK there are charitable organisations such as the Woodland Trust that own around 1,000 sites and which has long led the call for an increase in woodland within the UK which still remains as one of the least wooded nations within Europe. In 2005 there were already 167,000 people directly employed by forest industries, a figure it is hoped will increase with more sustainably managed forest and woodland areas. A sustainably managed forest revolves around assessing the best means to maintain the health and vitality of a forest while optimising its productivity given the ecological needs of the habitat being managed. By planting, selective logging and ensuring trees are allowed to mature, the resources of the forest are given the best chance to not just survive but to flourish. This in turn should enrich the bio-diversity of the forest and protect the soil while still allowing people to enjoy all the benefits outdoor spaces for leisure pursuits provide. At a time when the potential damage of climate change is apparent, well managed forests that help mitigate against such future problems by absorbing carbon dioxide are vital. These forests can help against harsh weather events that may become more regular. A forest sustainably managed in some of the ways mentioned have environmental, social and economic goals and benefits at their heart, something that ultimately serves all of our best interests. Next articleDo Electric Cars Make Environmental Sense? REACH Regulations – More EU Red Tape or a Chance to Save The Planet?